Situated in La Trinite-sur-Mer, this boutique hotel is 0.1 mi (0.1 km) from Quiberon Bay and 2.7 mi (4.3 km) from Carnac Beach. Musee de Carnac is 2.8 mi (4.4 km) away. Located in the heart of La Trinite-sur-Mer, this hotel is 0.1 mi (0.1 km) from Quiberon Bay and 2.4 mi (3.8 km) from Carnac Beach. Musee de Carnac and Casino Circus de Carnac are also within 3 mi (5 km). Situated in La Trinite-sur-Mer, this bed & breakfast is 0.1 mi (0.1 km) from Quiberon Bay and 3 mi (4.9 km) from Carnac Beach. Carnac Menhirs and Musee de Carnac are also within 3 mi (5 km). Situated by the ocean, this property is within a 15-minute walk of Quiberon Bay and Carnac Beach. Casino Circus de Carnac and Musee de Carnac are also within 3 mi (5 km). How Much is a Hotel Room in La Trinite-sur-Mer? Hotels in La Trinite-sur-Mer start at $71 per night. Prices and availability subject to change. Additional terms may apply. 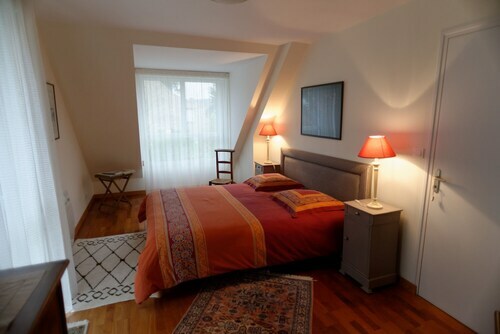 If you want interesting places to stay in La Trinite-sur-Mer, you'll be excited to find there is a large range of different options awaiting you. An exciting 22 places to stay await discovery inside a 6-mile (10-kilometer) radius from La Trinite-sur-Mer's urban core. Discovering the best accommodation within walking distance of central La Trinite-sur-Mer is a breeze. Travelocity's up-to-date city guide features the Hôtel Ostrea & sa Villa and Hôtel Le Trinité, which you can find within 0.6 miles (1 kilometer) of the urban center. 7 miles (12 kilometers) away from the center of La Trinite-sur-Mer, you can find the Miramar La Cigale. The Hotel Le Diana can be found approximately 2 miles (3 kilometers) away. Two more options worth checking out are the Sofitel Quiberon Thalassa Sea & Spa as well as the Citadelle Vauban Hôtel Musée. The greater Brittany region is certainly worth visiting as well. If you're a nature lover, be sure to explore Brittany's beaches, coastal plains and impressive rock formations. In addition, you should visit a selection of its castles, traditional villages and old towns. In this part of France adventurous visitors may also partake in mountain biking and cycling. Lorient is 20 miles (32 kilometers) to the northwest of La Trinite-sur-Mer and is where you'll find Musee de la Compagnie des Indes and La Thalassa. Some of our recommended Lorient hotels include the Mercure Lorient Centre Hotel and Rex Hotel. 20 miles (33 kilometers) to the south of La Trinite-sur-Mer, you'll find Bangor, which is home to the Castel Clara Thalasso & Spa and Hôtel Le Grand Large. The Donnant Beach and Goulphar Lighthouse are more popular sites to visit for those visiting Bangor. If you like sports and love watching local clashes be sure to spend a day at Stade du Moustoir, found 19 miles (31 kilometers) to the northwest of La Trinite-sur-Mer. Wise travelers wishing to find a room close by will love the ibis Styles Lorient Caudan or the Inter-hotel Cleria. 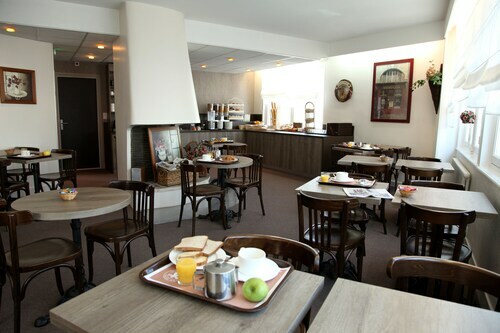 If you are planning on arriving or departing via Lorient - South Brittany Airport, you can book a Travelocity-listed room at Hôtel - Restaurant Les Astéries, or Maison d'hôtes Joliot Curie, which are each a short taxi ride away. The room was a little small. The bathroom and shower were separated from the bedroom by a door to a short hallway, which needlessly made the room smaller. The room was reasonably quiet. The staff was friendly enough, though we didn't interact much...checked in in the evening and checked out early morning.